I love fishing and sharing my knowledge of the sport with others. I welcome friends, families, and children onto the Corona Daze with the intention of making sure everyone has fun and catches fish. It would be my pleasure to be your Captain, and guide, the next time you go fishing. I also enjoy hosting guided scenic tours of the marshes, the inlet, and Figure 8 Island for people who don’t want to fish. I have learned a great deal about birds, shells, and the ecosystem throughout my years as a fisherman. 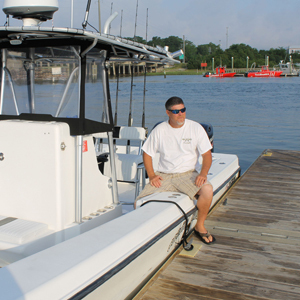 Captain Mike Hoffman is a native of Wilmington, NC who has been fishing since he was 5-years-old. He has been a full-time fisherman since 1987. He fished the Pro Bass Tour for 11 years, and during this time he won numerous awards. He got his captain’s license in 1998 and his Master Captain’s license in 2008. First Mate Michael Hoffman has been fishing with his dad since he was old enough to hold a fishing rod. He takes care of the bait, tackle, and beverages for the customers. He also drives the boat when needed and helps with navigation. He fishes every weekend, all summer, and any other time that school is out. Call Captain Mike today and book your next Wrightsville Beach fishing charter, Topsail Beach fishing charter, or Wilmington fishing charter.